As a caregiver one of your most important chomecare responsibilities is making sure that your aging parent stays safe and healthy no matter what adventures they go on in life. When it comes to getting outdoors and enjoying an active life during the summertime months, one of the potential risks that they face is Lyme disease. Understanding this disease can help you to ensure that your homecare efforts are designed to protect your parent from the dangers and keep them as healthy, strong, and safe as possible as they enjoy the warm weather months. 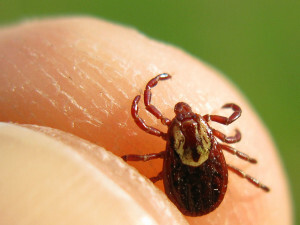 • This disease is caused predominantly by bites from infected ticks. • The Centers for Disease Control and Prevention estimate that there are approximately 300,000 cases of Lyme disease throughout the United States each year. • Though many people have the perception that Lyme disease is only an issue of the East Coast, the reality is that it can and does occur throughout the United States, including on the West Coast and in the center states. • On the East Coast the disease is generally caused by bites from the deer tick. • On the West Coat the disease is generally caused by bites from the black-legged tick. • One and a half times as many people as are diagnosed with breast cancer each year are diagnosed with Lyme disease. • Six times as many people as are diagnosed with HIV and AIDS each year are diagnosed with Lyme disease. • The ticks that carry the disease are generally found in grassy or wooded areas, which is why the majority of cases are experienced during the summer when more people go into such areas. • Older adults may be at particular risk for developing the disease because they are less likely to notice a tick that has lodged into the skin, meaning that it will stay on the skin longer and have more opportunity to transmit the bacteria. • The symptoms of Lyme disease can mimic those of other illnesses, which often results in people with Lyme disease getting false diagnoses. This can result in much more serious effects of the disease. • The majority of cases of Lyme disease are transmitted by the young form of ticks, referred to as nymphs. These immature arachnids are incredibly tiny, sometimes no bigger than a poppy seed, so they are difficult to detect and may feed for days before falling off or being found and removed. • The disease can impact the brain, heart, joints, muscles, and other systems within the body. If your aging parent is going to spend time outside during the summer months, it is important to take precautions to protect them from the dangers of Lyme disease. Ensure that they wear proper clothing as well as bug repellant to protect them from bites. Encourage them to do a thorough check of their body, or have you check their body thoroughly, after any time spent outdoors to detect ticks and remove them as soon as possible. If you or an aging loved one are considering Homecare Services in Radnor PA, please contact the caring staff at Alpine Home Care. In PA call 888-743-0068. In NJ call (855) 410-1404. The care that has been provided by the Alpine staff has been wonderful. Alice has done a wonderful job in caring for my husband, and has been nothing but professional. Alpine has always accommodated every request I have made. I have used other agencies before Alpine, and none of them has handled the care as well as Alpine, and has been nowhere near as professional. I would recommend this agency to anyone.